Jewellery from the new Layla Kaisi Collection “Blank Slate”. Images by Alethea Lim. Originality is something that many people are looking for when it comes to jewellery and it’s something The GoldLane Jewellery pride themselves on. The Glenfield-based jeweller is family-owned and offer unique, custom-made jewellery alongside their own collections. The Layla Kaisi Collection is the newest addition to their range and features elegant pieces that are modern and clean. The debut collection is “Blank Slate” for Pre-Fall 2017 which includes directional fine jewellery that is understated and refined. Each piece is hand-crafted locally in Auckland and is inspired by the moment when you first open your eyes and your mind is in a blissful blank state. 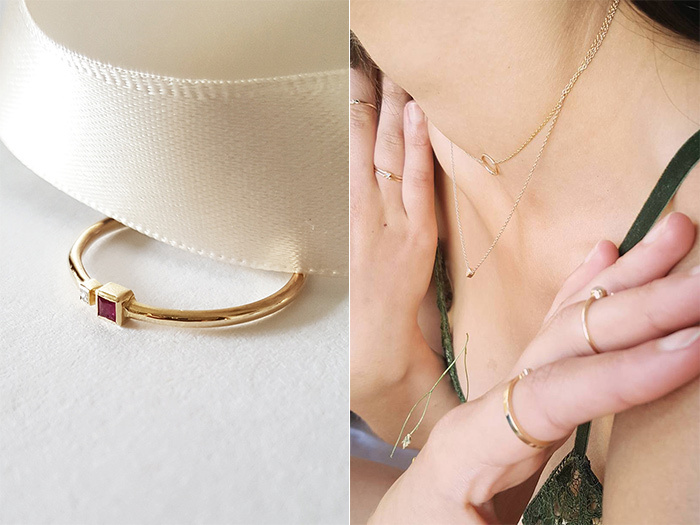 Designer Layla Kaisi’s hero piece of the collection is a minimalist ring called Vague (pictured below left) that pairs a beautiful squared ruby on a simple gold band next to a squared diamond. It’s a gorgeous piece that is sophisticated and would suit many different ages. The GoldLane Jewellery work only with conflict-free stones in accordance with the Kimberley Process so your purchase is also an ethical one.